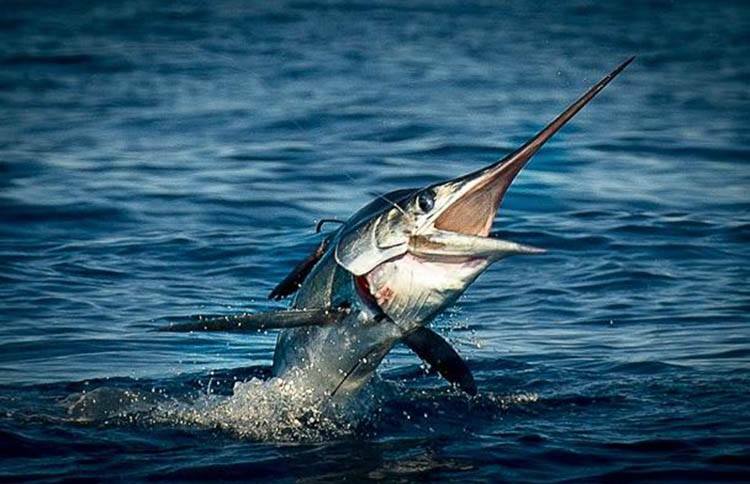 Cabo is known for some of the best sport fishing in the world. Each year thousands of visitors, from vacationing first-timers to seasoned anglers, come to Cabo and the azure waters of the Pacific Ocean and Sea of Cortez in search of this unique sport fishing opportunity. Whether it’s the thrill of wrestling an enormous black, blue or striped marlin or packing your cooler with the freshest yellow fin tuna, dorado (mahi-mahi) or wahoo, Cabo sport fishing offers that adrenaline rush that only comes from the sound of the whining reel signaling a great catch. Long before the luxury resorts and championship golf courses, Hollywood stars including John Wayne, Jackie Gleason, Desi Arnaz and Bing Crosby came to Southern Baja to relax and enjoy sport fishing in the 1950s. Eventually, the secret was leaked putting Cabo on the map as one of the greatest sport fishing destinations on the planet. Here you will find the best charter fleet in Latin America among the three marinas including, San Lucas, Palmilla and Puerto Los Cabos. Whether chartering with the Cabo resort fleets or a single skiff from one of the local “pangueros” on the beach, your Cabo sport fishing adventure will be a lasting memory. One of the newest and finest Cabo sport fishing charters is the “Cortez Cowboy,” skippered by Capt. Kevin Ledgerwood, an avid marlin fisherman with over 20 years experience with Cabo sport fishing. The mainstay of the Cortez Cowboy is a 35’ Cabo Convertible powered by two 435 HP CAT diesel engines and equipped with all the latest electronics, which provide nautical safety and technology to find the fish of your dreams. Onboard amenities include an air conditioned cabin, multi-speaker stereo, DVD player, microwave and a fully functional head/shower providing sporty comfort to avid anglers and their families, young or old. You’ll find only the finest gear and tackle including a variety of rods and reels to catch bait fish or land a large marlin or tuna. The one feature that sets the Cortez Cowboy apart from the others in Cabo sport fishing is its genuine fighting saddle. This unique design allows fishermen to literally “saddle up” with their feet in the stirrups while reeling that huge fish at the other end of the line. The Cortez Cowboy offers full day Cabo sport fishing packages including a variety of food and drinks, the finest tackle and an experienced deckhand to make your sport fishing adventure one you’ll remember and want to keep coming back. Check out their website for costs and further details.